This entry was posted on March 17, 2011 by Roc. Oolong (simplified Chinese: 乌龙; traditional Chinese: 烏龍; pinyin: wūlóng) is a traditional Chinese tea (Camellia sinensis) produced through a unique process including withering under the strong sun and oxidation before curling and twisting. Most oolong productions, especially fine quality ones, involved unique tea plant cultivars that are exclusively used for particular varieties. In terms of degree of fermentation, it can range from 8% to 85%, depending on the variety and production style. The popularity of this tea category is closely tied to tea connoisseurs of south China and Chinese expatriates in Southeast Asia, and the tea preparation process that originated from this area: gongfu tea-making, or the gongfu tea infusion approach. In Chinese tea culture, semi-oxidised oolong teas are collectively grouped as qīngchá (Chinese: 青茶; literally "blue-green tea"). The taste of oolong ranges hugely amongst various sub-varieties. It can be sweet and fruity with honey aromas, or woody and thick with roasted aromas,or green and fresh with bouquet aromas, all depending on the horticulture and style of production. Several subvarieties of oolong, including those produced in the Wuyi Mountains of northern Fujian and in the central mountains of Taiwan, are among the most famous Chinese teas. Different varieties of oolong are processed differently, but the leaves are formed into two distinct styles. Some are rolled into long curly leaves, while the others are 'wrap-curled' into small beads each with a tail. The former style is the more traditional of the two. The name oolong tea comes into the English language from the Chinese name (Chinese: 烏龍茶), meaning "black dragon tea". There are three widely accepted explanations on how the Chinese name came about. According to the "tribute tea" theory, oolong tea was a direct descendant of Dragon-Phoenix Tea Cake tribute tea. Oolong tea replaced it when loose tea came into fashion. Since it was dark, long and curly, it was called the Black Dragon tea. According to the "Wuyi" theory, oolong tea first existed in Wuyi Mountain. This is evidenced by Qing dynasty poems such as Wuyi Tea Song (Wuyi Chage) and Tea Tale (Chashuo). It was said that oolong tea was named after the part of Wuyi mountain where it was originally produced. 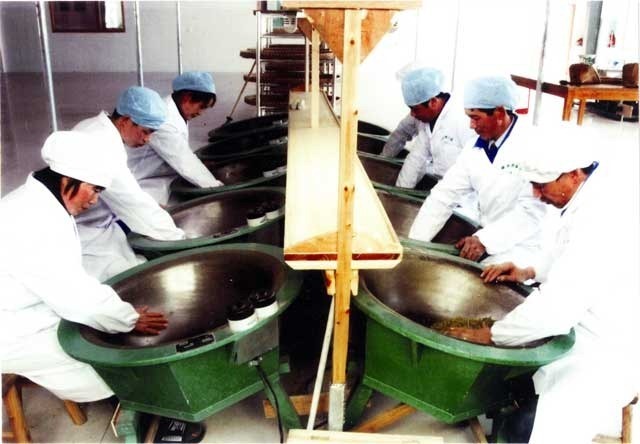 According to the "Anxi" theory, oolong tea had its origin in the Anxi oolong tea plant. A man named Sulong, Wulong or Wuliang discovered it. Another tale tells of a man named Wu Liang (later corrupted to Wu Long, or Oolong) who discovered oolong tea by accident when he was distracted by a deer after a hard day's tea-picking, and by the time he remembered about the tea it had already started to oxidize. For hundreds of years, this process was kept secret by tea makers in China, and even getting a glimpse into the intricate inner workings was virtually impossible for outsiders. Therefor the art of making oolong tea is little known outside China. Nowadays, even though most of the steps are public knowledge, aspiring imitators still find it hard to master the all of the skills needed to make truly great oolong tea. 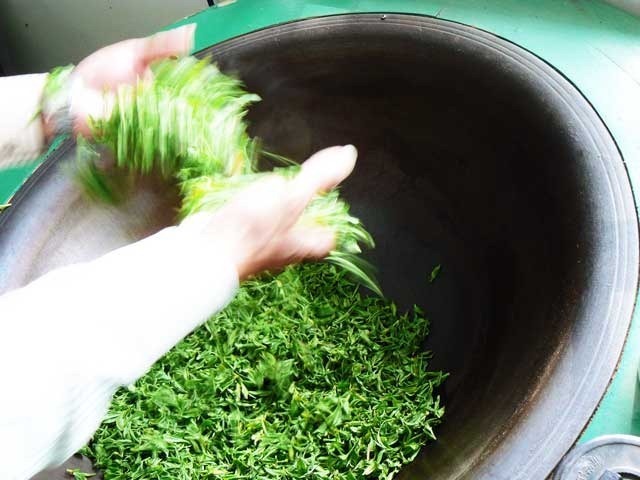 Generally speaking, there are 7 major steps in processing Wu Yi oolong tea. Oolong tea leaves are picked 3 to 4 times a year in spring, summer (once or twice) and autumn, which depending on the local climate conditions. Oolong tea is made from more mature leaves consisting of one bud with 3 or 4 leaves. Quality varies with the season. Spring and autumn tea are higher quality than summer tea. Leaves picked during early spring are generally considered to have the highest quality. Tender leaves picked earlier in the season may be used to make higher grade tea. The most exotic oolong tea - Champagne Oolong tea - uses younger leaves consisting of one-bud-and-two-leaf. 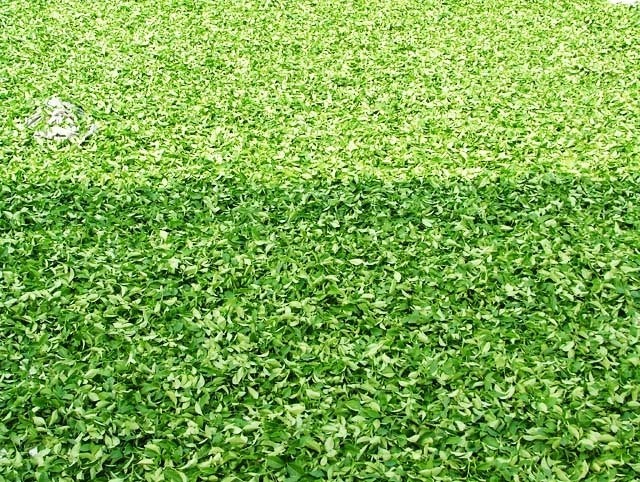 The harvesting process is very much alike to green and white tea. Only a properly trained tea picker knows how to gather the leaves in a way that maximizes their potential. 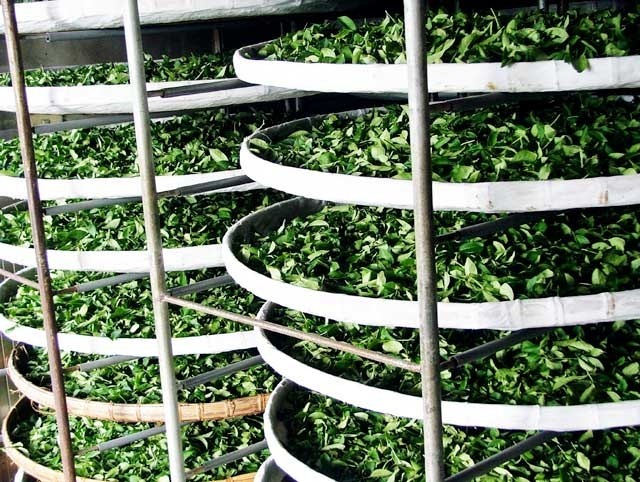 After picked, the fresh oolong tea leaves are immediately transferred onto large wooden plates to be dried. Most leaves are dried both indoors and outdoors to balance the effects of heating and cooling. This is important: the level of moisture determines how quickly tea polyphenols oxidize. As moisture vaporizes, fresh leaves soften and lose their natural springiness and luster. This is the most important step of the process. Bruising determines, to a very large extent, the quality and taste of oolong tea. A variety of techniques are used to bruise the leaves, including shaking and tumbling. Bruising is usually repeated many times to achieve an ideal level of oxidation. For the Wuyi Rock tea, it can take up to 10 hours. 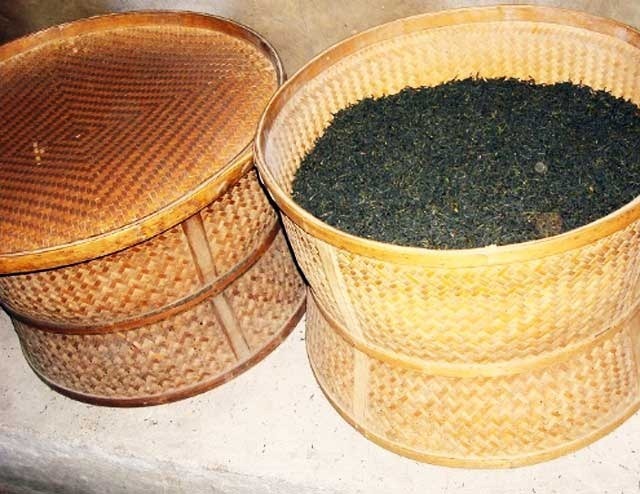 Tea-makers shake withered leaves in bamboo baskets and hand press them. Someone use a bamboo tube to implement this process. The friction bruises edges, exposes tea juices to air and speeds up oxidation. At the precise time when aroma substances have started to form and the tea leaves start to take on a red color, bruised leaves are pan-fried at high heat to kill the enzymes and stop the oxidation process. This process is called fixation or Kill Green(Kill-green is a literal translation of the Chinese phrase for “stopping the oxidation.”) and lasts only a very short time. 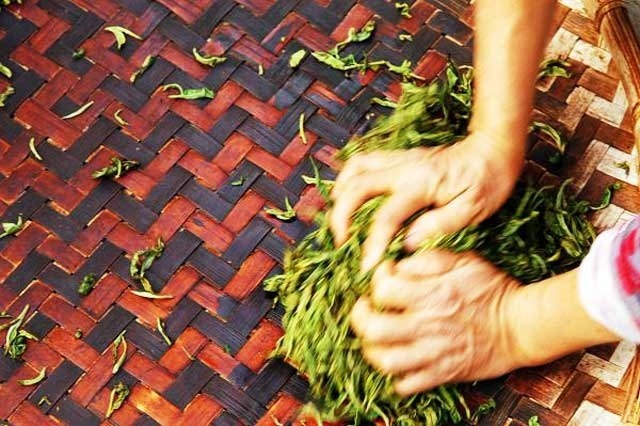 During this step, oolong tea leaves are rolled and rubbed into the right shape. This process should be repeated several times. If bruising “releases” the taste of oolong tea leaves, the second round of drying strengthens what has been released. Both high and low heat are used to completely remove moisture from the leaves and finalize their chemical profiles. In the initial fast-baking process, high heat is applied for a short period of time. 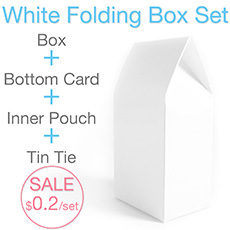 It removes moisture, stabilizes chemical profile and freezes external shape. For some types of aged oolong tea, this step will be repeated on a yearly basis. 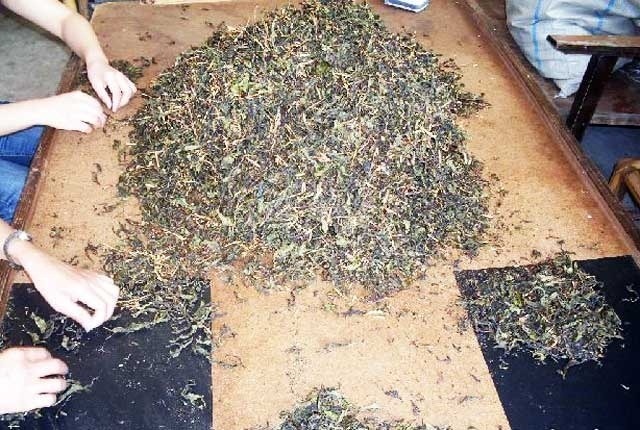 Tea leaves are sorted to remove sub standard leaves and twigs before they are transferred for packaging. This step is almost always done by hand, and skilled inspectors pick out inferior leaves. Some of the tea leaves may need to be re-heated later, then cooled and packaged. Some teas are made "on the spot" in the mountain. These teas are then carried down the mountain for storage in tea-houses. ChongAn, JianOu, JianYang, ShuiJi, Zhenghe area of Fujian. Also called Bailv. Literally White Monkey or White Green. Traditional famous tea of Zhenghe county. The most well-known oolong tea from Northern Fujian (Minbei) is the Wuyi Yan Cha, Also called Wuyi Cliff Tea or Rock Tea. Wuyi tea is not a single tea variety, but refers collectively to the teas grown in the Mt.Wuyi area of China. Wuyi Mountain is a large volcanic fault structure that consists mainly of vertical cliffs, deep gorges and cave systems. Wuyi tea is one of China's 10 famous teas. The mountain produces rare tea such as the Dahongpao (Big Red Robe). There are different kinds of Dahongpao tea. The most highly regarded is an authentic “pure breed” cultivated from the 300 year old original tea plant. Wuyi tea is characterized by medium oxidation and light rolling. It is long and curly rather than rounded. It is famous for its unique flavor known as the Rock Rhyme (Yanyun). Literally: Big Red Robe, a highly prized tea and a Sì Dà Míng Cōng (四大名樅, literally: The Four Great Bushes). This tea is also one of the two oolongs that make it to the list of Chinese famous teas. Literally: Golden Water Turtle, a Si Da Ming Cong. Literally: White Cockscomb, a Si Da Ming Cong tea. A light tea with light, yellowish leaves. Literally: Cinnamon, a dark tea with a spicy aroma. Literally: Water Sprite or Narcissus, a very dark tea, often grown elsewhere. Literally: Iron Goddess, this is a tea from Anxi in South Fujian. It is very famous, in fact a 'Chinese famous tea' and very popular. Literally: Golden Cassia or Golden Osmanthus. Is another tea from the Anxi area of Fujian Province. Similar to Tiě Guānyīn with a very fragrant flavor. Ti Kuan Yin, which in Chinese, means “Iron Goddess of Mercy.” There once was Kuan Yin, the goddess of mercy, who had a poor farmer who was devout and dedicated to maintaining her temple. One day, to reward him for his loyalty and commitment to her, she told him that the key to his future was outside of the temple. Outside he found a scrungy old bush, which he nursed to a flourishing bloom of greenish leaves. These leaves, of course, are the same as those in my teapot cup. A family of stripe-style oolong teas from Guangdong Province. The doppelganger of teas, Dancong teas are noted for their ability to naturally imitate the flavors and fragrances of various flowers and fruits, such as orange blossom, orchid, grapefruit, almond, ginger flower, etc. The name dan cong is often misinterpreted as meaning the tea is all picked from a single bush, grove, or clone. This is not correct. 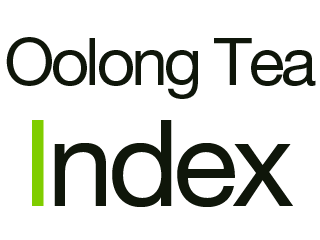 Dan cong is a botanical term that refers to the morphology of the tea plant. Most tea bushes emerge from the ground as a cluster of branches, however, the uncommon dan cong variety emerges as a single trunk that branches off higher up the stem. 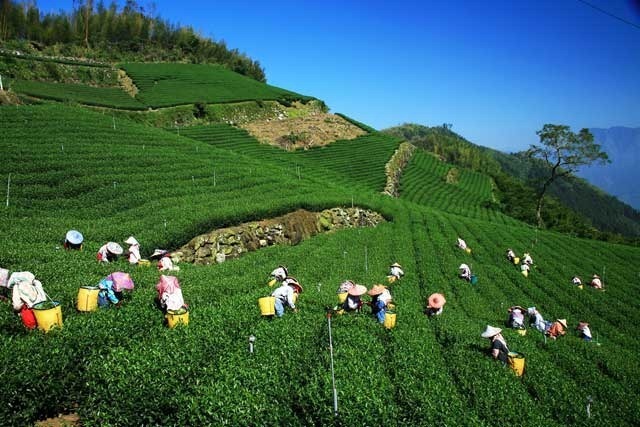 Tea cultivation only began in Taiwan in the mid-19th century. 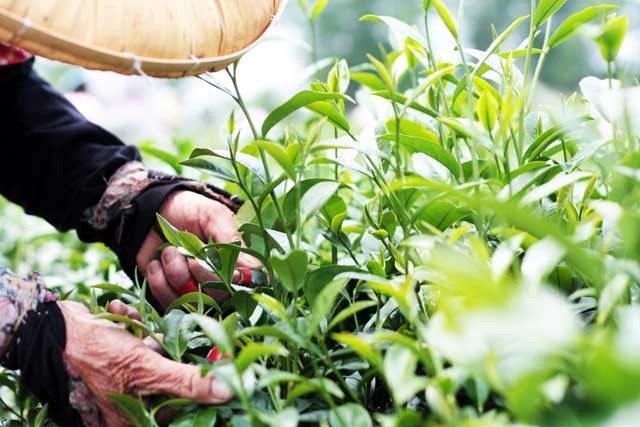 Since then, many of the teas which are grown in Fujian province have also been grown in Taiwan. Since the 1970s, the tea industry in Taiwan has grown at a rapid rate, in line with the rest of Taiwan's economy. Due to high domestic demand and a strong tea culture, the majority of Taiwanese tea is bought and consumed by the Taiwanese. As the weather in Taiwan is highly variable, quality of tea may differ from season to season. Although the island is not particularly large, it is geographically varied, with high, steep mountains rising quickly from low-lying coastal plains. The different weather patterns, temperatures, altitudes and soil ultimately result in differences in appearance, aroma and flavour of the tea grown in Taiwan. In some mountainous areas, teas have been cultivated at ever higher elevations to produce a unique sweet taste that fetches a premium price. The name means Frozen Summit or Ice Peak. Dong Ding is a mountain in Nantou County, Central Taiwan. This is a tightly rolled tea with a light, distinctive fragrance. The name means Oriental (Eastern) Beauty. Also known as Bai Hao Oolong. This tea is tippy (the leaves frequently have white or golden tips), with natural fruity aromas, a bright red appearance and a sweet taste. Grown in the Alishan area of Chiayi County, this tea has large rolled leaves that have a purple-green appearance when dry. It is grown at an elevation of 1,000 to 1,400 metres. There is only a short period during the growing season when the sun is strong, which results in a sweeter and less astringent brew. It produces a golden yellow tea which has a unique fruity aroma. Grown in the north-central region of Taiwan, this tea is very similar in appearance to Alishan teas, but is often considered to be one of the best teas from Taiwan. It is grown at an elevation of above 1,000 metres with Dayuling, Lishan, and Fusou being the best known regions and teas of Lishan. 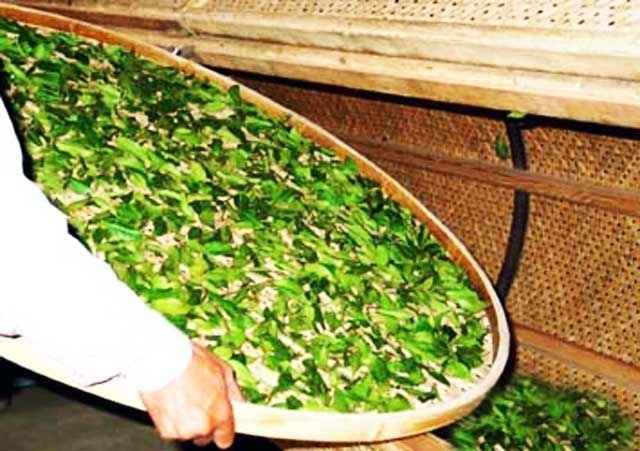 Also romanized as Bāozhǒng, the lightest and most floral oolong, with unrolled leaves of a light green to brown color. Originally grown in Fujian it is now widely cultivated and produced in Pinglin Township near Taipei, Taiwan. In China, Oolong or Wulong tea has long been believed to be beneficial in reducing and maintaining weight, but a study in 1998 confirmed that continous consumption of Oolong tea really does result in body weight reduction. More studies were conducted later on and found that Oolong makes body burn its own fat for energy. The weight reducing benefits of Oolong tea may also be a result of a fact that Oolong tea has absorption blocking potential. Oolong tea is known to have numerous health benefits. It is not only renowned for its taste but also for its ability toboost our overall health. But for people who like to keep in shape, one of the most positive effects of Oolong is the effect it has on the waist line. It can provide excellent support to a weight loss program, especially those involving cutting out carbohydrates from the diet. While naturally prepared Oolong tea is practically free of calories and contains just fractional grams of carbohydrates per serving, studies suggest that regular consumption of Oolong tea will speed up your metabolism so that you will burn about 80 plus more calories per day than you otherwise would. Oolong tea can also help you lower your triglyceride levels and even stave off the onset of type II diabetes. Oolong tea diet is best in combination with a carb controlled (not carb eliminating) diet and it also provides more long term and lasting positive health benefits on top of the immediate benefits of weight loss. With reducing your fat deposits permanently and giving you more energy, this Oolong tea carb-controlled diet is likely to lead to a reduced risk of heart disease and type II diabetes. Oolong tea will also provide your body with antioxidants which can prevent or undo the damage done by free-radicals. Furthermore, by removing free radicals from your bloodstream, Oolong tea can boost your skin health,immune system operation, and metabolic rate. Many things have been said about oolong tea. Among the most prominent benefits weight loss certainly stands out.Lets take a moment to learn how drinking Oolong tea can affect your weight and consequently your health. Studies have shown that Oolong tea does effectively three thing that combined contribute to weight loss. Caffeine is a potent stimulant. It increases body metabolism and thus energy consumption. A recent Chinese has shown that by drinking Oolong tea a person experiences and increased energy conumption of about 3% or 70 calories. Impressive? Not really. 70 calories is really not that much - an average person requires approx. 1000 calories so 70 in comparison is not that much. And lets not forget that caffeine is present in many drinks in greater concentration than in Oolong tea. But there’s more! A later Japanese study comaring the weight loss effects of Green tea and Oolong tea expanded on the results of the Chinese study. Carefully analysed green and Oolong tea were given to the test subjects. As expected the fat burn effects were stronger with the Oolong tea but when measuring the caffeine and EGCG concentrations in the two teas it was found that both teas have the same amounts of the substances that were thought to bring the weight loss effects. A third group of substances - polyphenols - were found in much greater concentration in Oolong tea than in Green tea. This find finally showed the real active substance of Oolong tea. Of course Oolong tea is not a miracle drug for weight loss. The same rules apply as with every weight loss attempt. Watch your eating, excercise and dring Oolong tea. The tea might just give you that initial boost so you see the results quickly and don’t give up in the first two weeks. The Classic of Tea (Chinese: 茶經 or 茶经; pinyin: Chá jīng), a Chinese book written in the 8th century by Lu Yu (Chinese: traditional 陸羽, simplified 陆羽; pinyin: Lù Yǔ; 733–804), contains the first known treatise on the subject of the gongfu style tea ceremony. 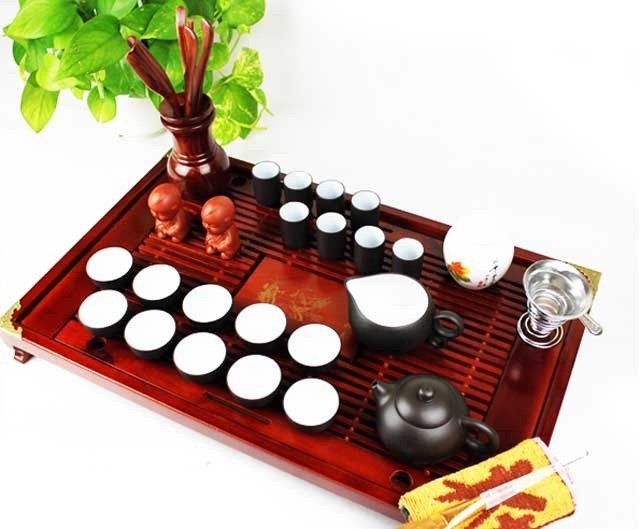 This style of tea consumption has remained consistently popular since the Qing dynasty, and remains one of the primary ceremonial methods of tea consumption in china. Ancient Chinese believed drinking tea was a way of connecting one’s body and soul to nature. It was a divine process that became a formal ritual. 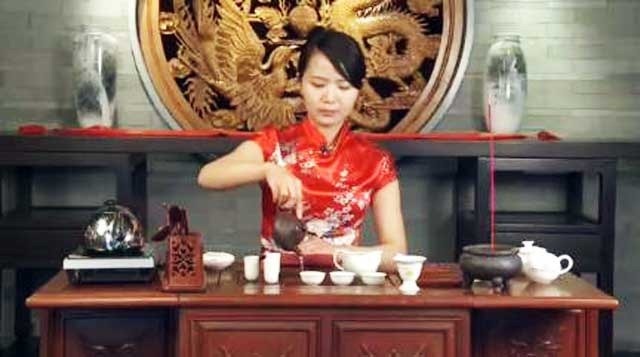 Chinese oolong tea culture developed to a climax during the Ming and Qing dynasties, and it was at this time that “Changzhou Gong Fu Cha,” the traditional tea ceremony for oolong tea, originated and spread across China. Oolong tea is a special variety of Chinese tea with unique, complex character that combines the nuances of both green tea and black tea. It is generally believed the only an elaborate Changzhou Gong Fu Cha tea ceremony can fully bring out the best qualities of this tea. A small Yixing clay teapot (ZiSha), around 150 ml in volume. Tea serving pitcher used to ensure the consistency of the flavor of the tea. Good water is key to brewing an excellent pot of oolong tea and will greatly affect the outcome. According to most tea masters, spring water or bottled water should be used. Distilled water or tap water should be avoided. As a communion with nature, oolong tea ceremonies are best carried out in a quiet, beautiful environment. Soft, traditional Chinese music is usually played, and sandalwood incense is burned to give a relaxing fragrance. 1. Burn incense and tranquilize the mind(焚香静气) – The first stage of Changzhou Gong Fu Cha is meant to create a peaceful environment and relax the participants by burning incense. 2. Show the guests the excellent tea leaves(叶嘉酬宾) – All of the guests will take a close look at the oolong tea leaves to appreciate the appearance and smell. 3. Boil the mountain spring with fire (火煮山泉) – Water is boiled using a kettle and then brought down to a temperature between 80 – 95°C. The temperature of the water can be determined by timing, as well as the size and the sizzling sound made by the air bubbles in the kettle. At 75-85°C, the bubbles formed are known as "crab eyes" and are about 3 mm in diameter. They are accompanied by loud, rapid sizzling sounds. At 90-95°C, the bubbles, which are now around 8 mm in diameter and accompanied by less frequent sizzling sounds and a lower sizzling pitch, are dubbed "fish eyes". When the water is boiling, neither the formation of air bubbles nor sizzling sounds occurs. At high altitudes water boils at lower temperatures, so the above rules cannot be applied. 4. Rinse Meng Cheng’s Yixing teapot (孟臣淋漓) –Boiled water is used to wash and warm up the teapot. Meng Cheng refers to a famous teapot master. 5. The black dragon (oolong tea) enters the palace (乌龙入宫) – Oolong tea is transferred to the teapot with a wooden teaspoon. The teapot is usually filled 1/3 or 2/3 full. 6. Rinse the leaves from an elevated pot (悬壶高冲) – The teapot is placed on a water-catching tray, and hot water is poured from high above. This is to rinse the tea leaves; this infusion is not for drinking. 7. A spring wind brushes the surface (春风拂面) – Bubbles and broken tea leaves floating in the water are brushed away with the lid of the teapot. 8. Wash the immortal’s face twice (重洗仙颜) – The teapot is once again rinsed with hot water to ensure that the temperature is the same on the inside and outside. Immediately after rinsing, the water in the teapot is discarded. 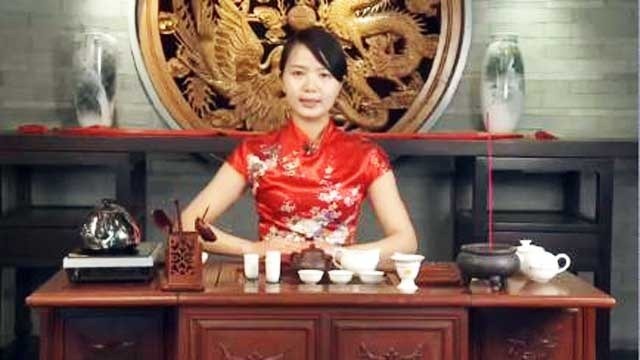 9.Ruo Chen plays the melody (若琛出韵) – Tea cups will be washed with hot water at this point. Ruo Chen is a famous tea cup maker from the Qing dynasty. 10. Jade fluid returns to the teapot (玉液回壶) – Now it’s time to brew the first batch of oolong tea. Fresh hot water is poured into the teapot, filling it to the mouth. The tea is allowed to infuse for 1-2 minutes before it’s served, and some oolong tea masters will repeat this step several times to prepare tea for all the guests before serving anyone. These masters pour the tea from each infusion into a large tea Serving Pitcher until enough oolong tea has been brewed. 11. Take a tour of the mountain and river (游山玩水) – The teapot is shaken lightly to remove the water on the bottom so it won’t flow into the tea cups. 12. Guan Gong patrols the city (关公巡城) – Tea is poured for each guest. 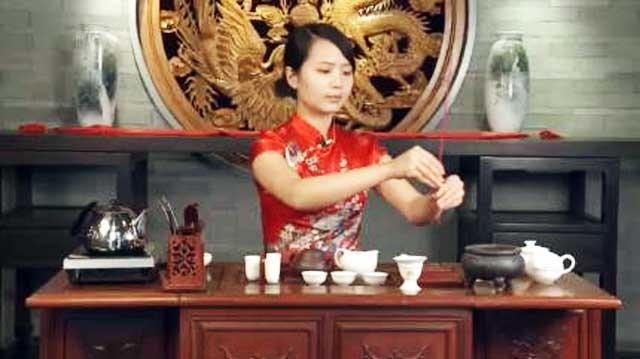 To the Chinese, pouring the tea evenly into cups placed in a row conjures up the image of Guan Gong, a famous general from the Three Kingdoms period. 13. Han Xin calls the soldiers (韩信点兵) – The last drops are poured out in one graceful movement. This motion is likened to Han Xin, a famous Han dynasty general, ordering his soldiers to fight. 14. Three dragons support the vessel (三龙护鼎) – This phrase vividly demonstrates how a oolong tea drinker should hold his/her tea cup – hold the sides with your thumb and index finger, and use your middle finger to support the bottom. 15. Happily smell the elegant fragrance (喜闻幽香) – Before drinking, the special fragrance of oolong tea should first be appreciated. Here “aroma appreciation cups” are usually used. They are placed upside-down on the drinking cups to capture all of the smells. 16. Appreciate the three colors (鉴赏三色) – After brewing, oolong tea often exhibits slightly different colors at the top, middle, and bottom. By looking at these colors, tea experts can tell the quality of the tea. 17. Tasting the marvelous tea (初品奇茗) – Oolong tea is finally drank at this point, and the tea ceremony is approaching an end. The ceremony ends with the used tea leaves being put into a clean bowl for the guests to appreciate the tea in its used form. Good etiquette dictates that the guests should make appropriate compliments regarding the choice of tea. Cleaning up is an important step in the ritual. Brewed tea and tea leaves should not remain in the teapot after the ritual. The pot must be cleaned up thoroughly and rinsed with hot tea. Utensils must be sterilized with boiling water. The teapot should be rinsed with hot tea and the outside should be rubbed and polished with a good linen cloth. A teapot should never be rinsed with water, nor washed with detergents or soaps. The tea pot must be allowed to dry naturally. The utensils and serving cups should be allowed to air dry on a tea tray.